The Novium Museum has been awarded a grant of £1,100 from the Roman Research Trust and The Roman Society to support this year's Chichester Roman Week. Roman Week 2018, which is organised by The Novium Museum and supported by Chichester BID, will take place throughout Chichester City Centre during May half term; Monday, 28 May - Saturday, 2 June 2018 and will feature a vibrant programme of talks, trails, guided tours and family activities. The grant will fund a Roman re-enactment by Legio Secunda Augusta, which will be the highlight of Roman Week, to take place in Priory Park on Wednesday 30 May. The interactive re-enactment, which will encourage audience participation, will include a military show and slave auction as well as a range of static displays such as a military camp and a field medicine tent. Legio Secunda Augusta is one of Europe's pre-eminent Roman re-enactment groups and encompasses the full range of military and civil life- from artillery, to slaves, medical staff and music. They provide an unforgettable live experience for anyone witnessing a re-enactment. Councillor Eileen Lintill, Cabinet Member for Community Services at Chichester District Council says "Chichester Roman Week is now in its third year, and this generous grant will allow us to make it bigger and better than ever. "Priory Park, with its rich Roman history, is the perfect setting for this re-enactment and we hope to encourage as many people as possible to come in to Chichester City Centre to immerse themselves in this free interactive experience of Roman heritage." The Roman Society for the Promotion of Roman Studies was founded in 1910 to advance the understanding of ancient Rome and the Roman Empire. The leading organisation in the United Kingdom for those interested in the study of the Roman Empire, the Society consists of more than 2000 members from over 40 counties and supports research and publications; provides training opportunities for young researchers; promotes the teaching of Latin in schools; as well as sponsoring conferences, public events and outreach with the Roman Research Trust. 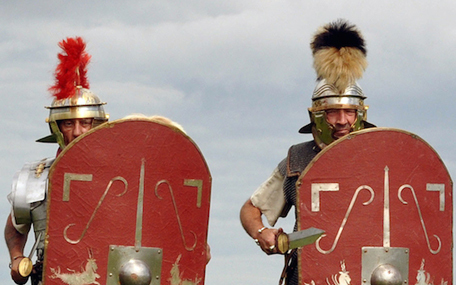 Find out more about Roman Week and the re-enactment in Priory Park.